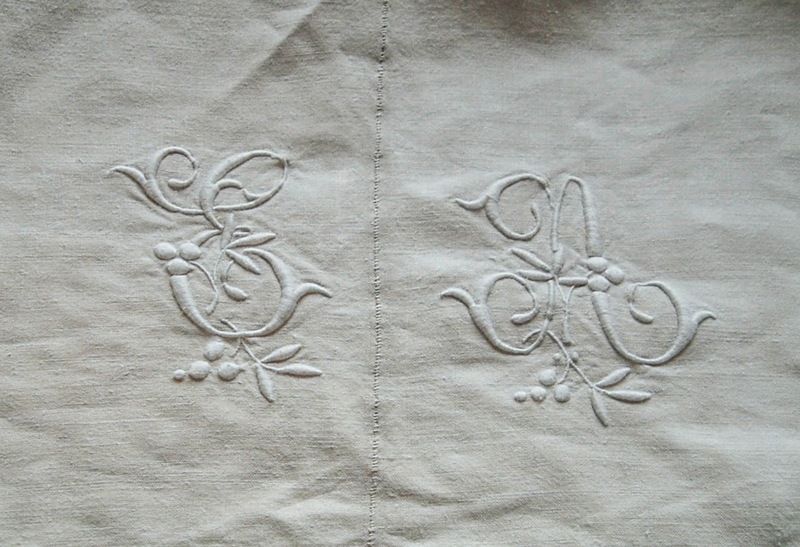 Homespun Stitchworks..... For the love of vintage: Antique French Linens....Oooh La La! For me, at least, I believe that vintage French linen sheets are the best basis for my vintage samplers and pictures. I love the weave and this makes the base strong along with the hue of the linen, just right for what I am creating. I remember buying my first Vintage French linen sheet, it cost a lot of money and was pre 1900. When I got it home and had washed and pressed it, I just stared at this thing of beauty. I was going to cut it up, was I mad? I went and got my journal out with my sketches to check that one.. I was happy with the design and two .. it was worth carving this piece of history up!! When I actually had the scissors in my hand I was shaking dreadfully! Now, well I buy for my needs and justify it to myself that on each sampler at the back there is a handmade paper envelope with a little card inside detailing the materials used. How old the linen is and the fabrics and buttons. The provenience of each scrap contained for future generations. It can be handed down that little bit of history..... but it already has over 100 years of history behind the glass because of the age of the fabrics and materials used, and that pleases me. Vintage carved mother of pearl buttons that are once again being seen as a thing of beauty and not in a box in a drawer somewhere and in addition to that there is the matter of the fabrics used that are now on show too! I am not sure why you are not getting the blogs but there has been one everyday except Sunday. I do not write a blog on a Sunday and occasionally on a Saturday. You can read my blog everyday on here and it is usually up and running around 8am. It is very busy at the moment but very enjoyable too.